I would say this is an acceptable start for an album.It has most elements a fan of oldschool death-thrash wants to hear; furious rythm sections,raspy vocals,malevolent ambiance.Although,I must underline the fact that the lead guitar work is slightly poor.I have been cringing slightly while listening to what sounds very much like improvized and generic,filler-type soloing.I have been hoping in vain that this would improve as the song progresses,but I came out of this empty-handed.This element alone does ruin the magic for me.You have to be quite the diehard thrash metal fan to move past this and give the rest of the album a chance. This track gives me the feeling that what we have here is a band that has at least a bit of a clue when it comes to throwing in some (if very few) good hooks into songs,having the listener headbanging along for so little a moment.This is most definitely something I can hand to them.The downside to this is basically that these hooks are thrown into an absolute directionless mess.The beginning of the song is catchy,but soon turns into an absolutely bland and pedestrian affair that stretches out to no end.The hyperactive technical-masturbation the lead-guitarist is throwing into the mix does very little to tame the boredom as it still gives me the feeling that it has been improvized on the spot,only for the sake of responding to the popular demand that the pattern of a song has to include that god-forsaken solo.The ending of the song is somewhat of a return to the catchiness of its beginning,and oddly enough,seems to have more of a structure,more of a direction,more of a relevance. This being an interlude,I'm not immensely surprised that it won't have enough of a weighing power to convince me that things are getting brighter in the songwriting department.I have to admit that in this case,the wee interlude should have been taken out of the tracklist.Sound effects of a sadistic war are being extremely overused on thrash metal,and folk metal albums.It does very little ( read: nothing at all) to convince anyone that it makes the ensemble of the sound more badass.This time,both the rythmic section and the leads sound absolutely sloppy.It's a wonder no one in the band had any second thoughts about including this stinker on the disc. I would say this is a listenable track.The main riff,although it is quite painfully unoriginal,gets me nodding my head along,even though I'm nowhere near a headbanging frenzy.The main downer is probably that its repetitiveness is watering it down to the point of making you wish the song was shorter.Most of the riffs in the rythm section have been copied and pasted from already existent thrash metal releases,even though I might add that said riffs are probably the most simplistic I have heard in the history of this sub-genre.It is quite a poor tribute to the gods.The lead guitar work at the beginning of the song is laughably useless.I've been quite surprised to find out that midway through the track,it actually does sound like it's been written to add a nice touch to the ensemble of the track,but it doesn't exactly make me hyperventilate with enthusiasm yet. 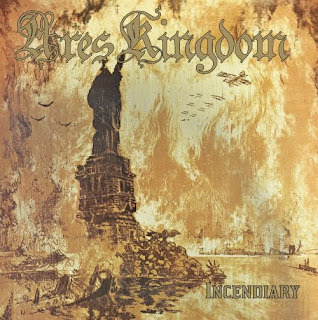 I am pleasantly surprised to find out that this band does have some melodious chops to bring to the table.Since the beginning of my journey with this album,this is the first track that distinctively showcases a general direction,complete with an interesting melodious progression.It has a bit of a viking-esque feel,the main riff being a nice and much needed breath of fresh air within the sea of distaste this album has been so far.This is quite the sweet tune,even though it doesn't break bricks at this point. This is yet again a listenable track,even a slightly catchy one.Its lenght certainly wouldn't've suffered a slight trim,being quite a linear offering,but I will cut the band some slack and give them some credit for bringing up a nifty,slightly OWOBH-sounding thrash metal cut that is still a good listen,while not reinventing the wheel by any means. Another interlude that carries a well-built little melody,and actually serves as better filler than ''The Destruction of Sennacherib'' for bloody sure. Although this is another clearly organized offering,with even a twang of melodious effort into it,the blandness and excessive lenght of this track most definitely turn me off.It does shy away from having a distinct personnality.It seriously lacks ferocity.Its vagueness does force me to classify this as another very blatant filler. Ending the album on a slightly more positive note,I have to say that for once,the lenght of a track on this record is actually pretty close to being justified.This one track has more variations than I thought I could possibly witness within this band's songwriting capacities so far.It is quite a reasonably interesting,if not a bit of a third-tier thrash metal cut. RATING: 4/10 The second half of this album is most definitely much more of a point of reference to rate this album than the opening half.The major down-points that we have here is the randomness of the leads,and the lack of audacity when it comes to the creative voice of the riffage.I have a feeling that this band is capable of peeling faces off,only I can't help but feel that they need to work on their craft a lot more before they step up with a disc.This is quite a disappointing and faceless effort. Last saturday's installment of my show is up!